Using successful communications and marketing strategies is an important way to increase the visibility of sustainable public transport systems. Photo by Caribb. Consider McDonald’s golden arches for a moment. Now think about the Nike swoosh, or Apple’s, well, apple. There’s no denying that the power of branding and marketing is immense. For those of us in the sustainable urban transport world, we can take lessons from giants like McDonald’s, Nike, and Apple, and apply them to public transit systems. L.A. Metro has done it, and others are ready to follow. Let’s make it the norm to have strong, dynamic, playful brands that entice you to ride public transport. This Friday I have been invited to speak at the Quebec Urban Transport Conference (Colloque de l’Association du Transport Urbain du Québec) on successful influence strategies for public transport operators. This post focuses on lessons learned on the ground (EMBARQ has teams in six countries), gives you a sneak peak of my presentation, and leaves you with three building blocks of marketing sustainable transport. The motivation behind a public transport marketing scheme must be clear and focused to be effective. For each campaign, public transport operators must keep three simple goals individually or collectively in mind – attract new users, retain current users, and secure support from government and civil society leaders. To make public transport the best way to go, transport operators need to cater to the people contributing to the congestion of your city’s streets with private vehicles right now. Influence strategies must be targeted to regular car (or motorcycle) users in order to attract them to public transport. However, operators can’t afford the luxury of overlooking current users. They are today’s riders, and you have got to keep them happy and informed. Above all, you need to listen to their feedback in order to keep improving the quality of your transport system. Finally, influence strategies need also to secure support from city leaders and civil society so that sustainable public transport is appropriately funded, and benefits all in the city. When crafting a brand, public transport operators should choose to stand out from the crowd. A bold, visually appealing brand should engage passengers not only through a logo, typeface, and color scheme, but also through the design of vehicles and stations across the system. See the L.A. Metro for a great example. Once a brand is developed, it’s crucial to unify all parts of the system through always adhering to the brand. If you’re not launching a completely new brand, but transitioning to a new version of an existing one, then pay attention to the details of the transition: the success of your rebranding will be driven by how well you communicate during this process. Personally, I would advocate for a soft transition to the new brand, instead of a “big bang” approach where you trash your all communications material and replace them with completely new material overnight. Change takes time, and you should walk your users through the visual transformation of your system. Transport operators have lots of employees who often reflect the demographics of their users, and they are in contact daily with riders. Listen to them! When you create a system that truly listens to your employees, use it to provide them with updates on how you’re changing their agency. They’ll help you put your best face forward. If passengers don’t understand the services you provide, they won’t use them. User education is key, and not just when you launch a new service, metro line, or bus corridor. EMBARQ Brazil has been very successful at helping operators market their Bus Rapid Transit systems. Check out TheCityFix Brasil to learn more about Experiência BRT. The first rule of thumb for user education is that it’s never too early to educate passengers about a new project or service – just make sure to answer the right questions: who, what, where, when, how, and why. By doing so, public transport operators can make their systems familiar to city residents. Information kiosks, station ambassadors, outreach in schools (kids are excellent messengers for informing a wider group of people, starting with their families), and local news segments are other good ways to engage your community and increase the visibility of your system. I will be posting my presentation on EMBARQ’s SlideShare shortly after the conference. Feel free to leave me your comments here about the best communications and marketing practices of public transport systems you’ve experienced yourself! Kyle Mackie also contributed to this blog post. 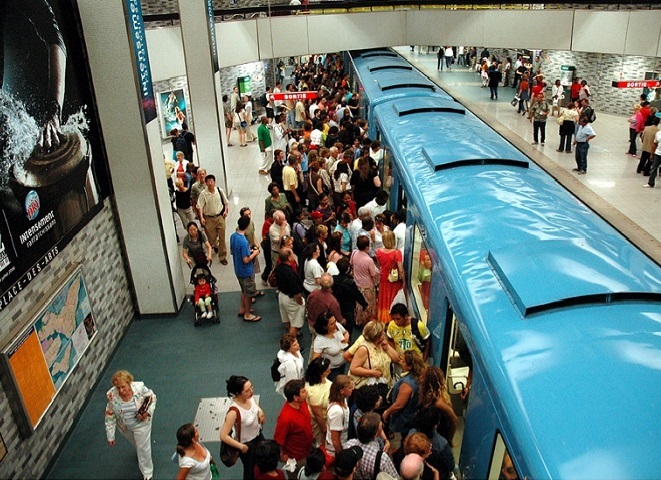 Can this Santiago Metro innovation end gridlocked platforms once and for all?